Born and raised in Nebraska’s rural farming area, Donna Binfield draws and paints the world around her. A lifetime outdoors has kept her in close contact with nature, and part of her passion for painting has been inspired by her desire to share a piece of nature with the viewer. She began her career in early grade school where her life-like drawings of horses were in demand among her classmates. A rural studio near Hastings, Nebraska is a comfortable setting for the artist, where she lives with her husband, various dogs, cats, and horses near where she grew up. 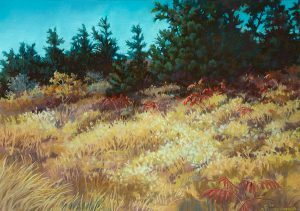 Studying with many nationally-known artists, her primary media is pastel, although she also works in oil, acrylic, and watercolor. Many years of drawing with pencil has led to keen visual perception. She has received recognition and many awards for her work, and has shown in regional and national juried competitions. She also teaches classes and workshops throughout Nebraska and Kansas. Binfield is a past president of the Association of Nebraska Art Clubs and a Signature Member of the Chicago Pastel Painters. Donna Binfield has one work in MONA’s collection.